Hi everyone! Well, I have to learn not to predict what I will be doing from week to week! 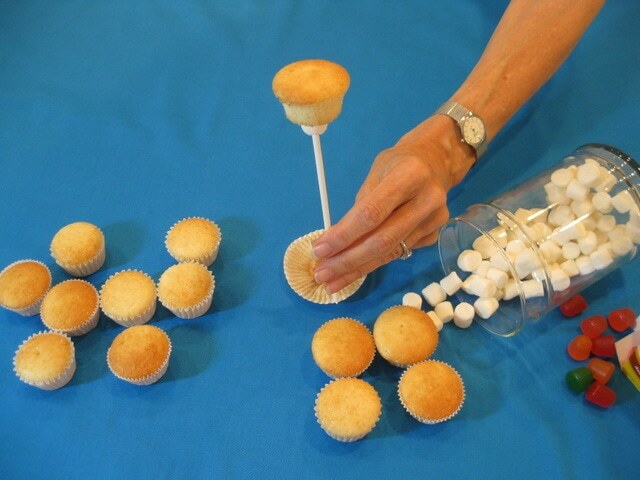 The plan was a cupcake cake- tutorial–and I will do that soon….but we changed directions on you. There are so many ideas that we want to try! The popularity of Bakerella’s cake pops (bakerella.com) has inspired blogs, bakieries, and dessert goddesses everywhere to grab their favorite bite sized treats and put them on a stick! Today, BeBe and I made some sweetness. 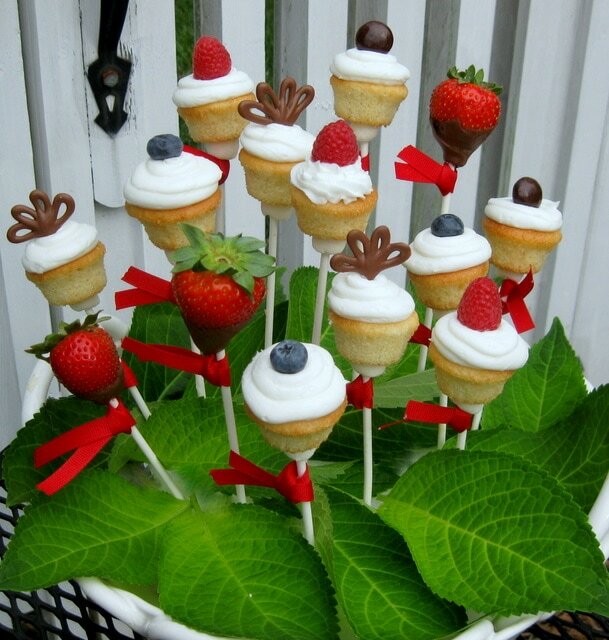 Mini cupcakes and strawberries on sticks! AKA, lollicuppies (I just made that up) – and lolliberries. Let’s do it! 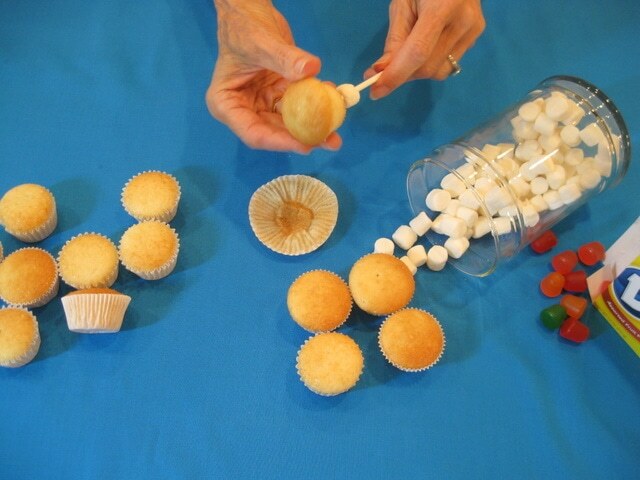 First, you’ll need some mini cupcakes, mini marshmallows (or Dots candy) and lollipop sticks. I like the long lollipop sticks–mine are 8 inches. Go ahead and slide a mini marshmallow onto your stick. This is going to give our cuppies a little support. Using Dots as an “anchor” is a cute idea too–especially if you are going with a colorful theme. Other ideas are: gum drops and multi colored mini marshmallows. You can cut them in half if you would like for less color to show. 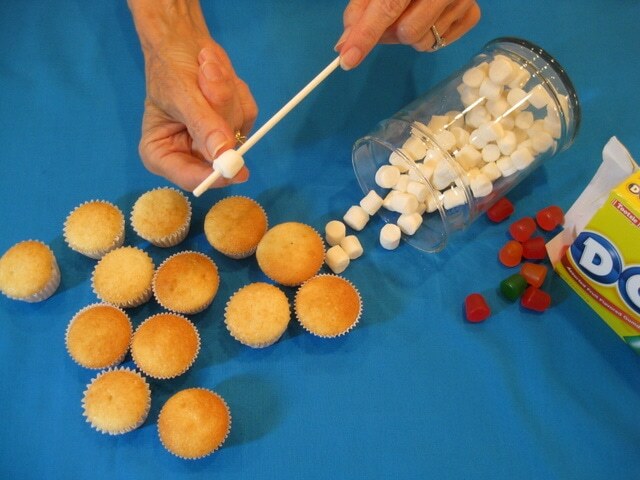 Next, slide the cupcakes onto the stick! *Removing the liners is an optional step. The cupcakes will stay fresh longer if you keep the liners on (and look just as cute!) 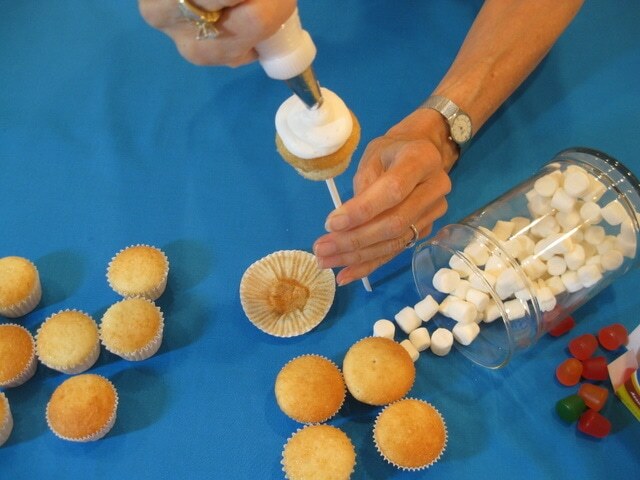 ;0)— If you leave the liners on, just make the hole in the bottom of the cupcake with something sharp like a toothpick or skewer before sliding it into position. Now it’s time for hair and make-up. BeBe is applying a scrumptious swirl of buttercream. Here are some accessories! The chocolate squiggles were piped from melted candy melts and then chilled for a few minutes until firm. They make very cute toppers! I also used raspberries, blueberries, and junior mints! 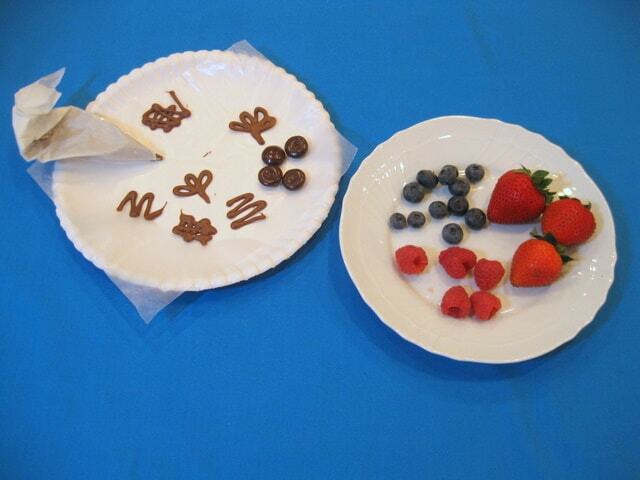 As for the strawberries–I made them into lolliberries. 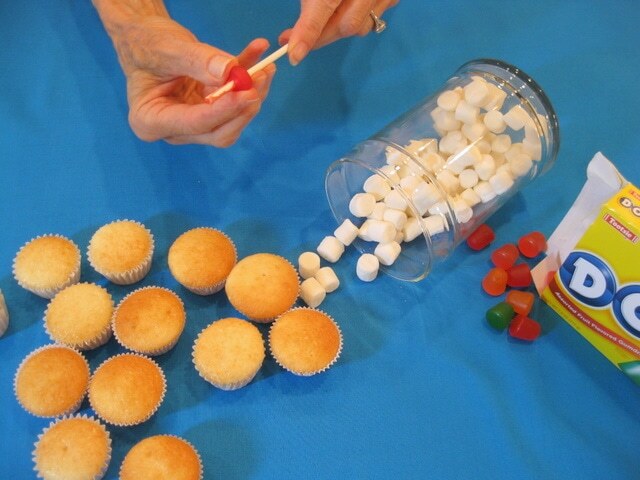 :0) Dip in melted candy melts and apply stick– easy! Tie some ribbons for some added color and cuteness, and you have a fun dessert that serves as a centerpiece too! Anchor your sweetness into a syrofoam block (at least that what I did!) and sit in a cute or decorative container. These hydrangea leaves were perfect for adding a little personality AND hiding the styrofoam. Hooray! That’s all for now! Hope you enjoyed this little tutorial! I’ve found the cake pops just too hard to make. This idea rocks and looks totally easy to do. I make a little “pop” bouquet for my daughter’s teacher on the first day of school. She’ll be getting a bouquet of cupcakes this year. Thanks again, Melissa, for another GREAT idea. A friend of mind did these using the ribbon roses you did on the sides of the cake making it into a bouquet of roses. I couldn’t understand how the cupcakes didn’t twist and fall off but you’ve answered my questions! Thank you! Thanks so very much for sharing these ideas! 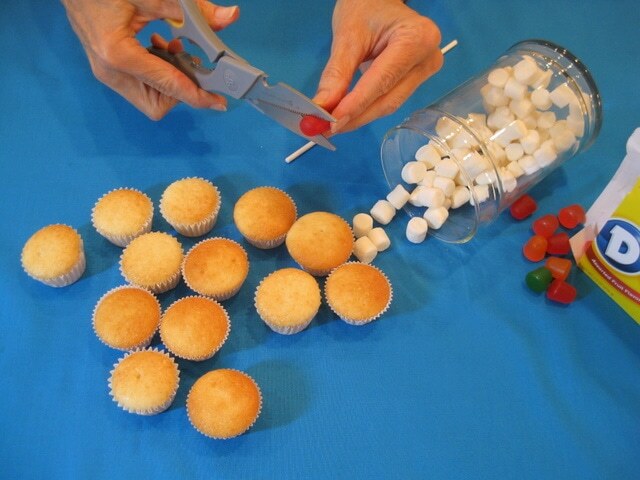 I love making mini cupcakes and brownies and will do these next time for my granddaughters. They will love them! I am soo gonna make these! !